As the season moves into summer the diversity of plants increases as the upland prairie part of the Garden begins to produce a variety of blooms while there are still some blooms in the woodland and the marsh. Here is a small selection of five that you might not find at the local nursery - but in the Garden? YES. The link on the plant name takes you to a full information page with more photos of that plant. Wild Quinine (Parthenium integrifolium L.) Or sometimes called 'American Feverfew'. This is a big tall plant with white snowball flower heads that is quite rare in the wild in Minnesota and listed by the DNR as ‘endangered’. It was found only in four SE Minnesota counties and the DNR has recently acquired two abandoned railroad rights of way where it has been found and designated those strips as a Scientific and Natural Area. 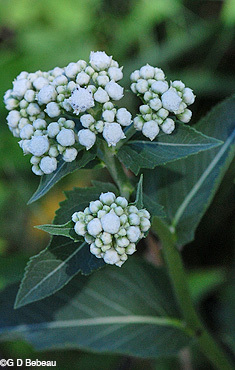 The white flower is somewhat unique in that there are five fertile ray flowers widely spaced around the flower head, sticking up like little rabbit ears and these surround a group of infertile disc florets. In fact the genus name comes from the Greek word parthenos meaning "virgin" which refers to the central infertile disk of the flower. While there have been some medicinal uses reported for the plant, principally as a diuretic, the reported association of the plant as as substitute for medicinal quinine is not established. The plant does make a bold statement in a prairie garden. 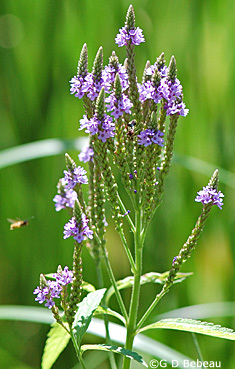 Swamp Vervain is actually the better name as it likes moist places and while the flowers are blue, so are several other Vervains. These become tall plants - up to 40 inches, with multiple flower spikes atop the stem, but only a few flowers open at any given time, so flowering lasts for awhile. You can easily find this plant around local ponds and streams and marshes. it is indigenous to the Garden. The species name hastata refers to the leaf which has a spear shape with a basal lobe that faces out like a halberd on a sword blade. The name vervain is said to be derived from the Celtic ferfaen, that is from fer (to drive away) and from faen (a stone). In early times the plant was used for afflictions of the bladder. Frances Densmore in her study of the Minnesota Chippewa reports of their usage of the dried flowers as "snuffed" to cure nosebleed. Current research indicates using Blue Vervain medicinally can interfere with blood pressure medications. The plant is found throughout North America. Rough-fruited Cinquefoil (Potentilla recta L.) Also known as Sulphur Cinquefoil and Sulphur Five-fingers. This is an introduced plant from Europe and Asia, now well established across most of North America. The ‘sulphur’ part of various alternate names for this plant refers to the pale yellow color of the flower - which against the dark green of the foliage, is quite striking. The ‘five fingers’ represent the typical 5 lobes of the leaf. The entire plant is hairy, but the ‘rough-fruited’ part of the name actually refers to the ridges on the small seeds, not to the texture of the plant. When Martha Crone was curator of Eloise Butler, there were 13 of the 19 Cinquefoils found in Minnesota present in Eloise Butler. Today we are down to three. It’s a nice plant, not aggressive, but can form clumps. The seeds remain on the plant until the wind shakes the stems strongly enough to dislodge them and then they fall near the parent plant. Fireweed (Epilobium angustifolium L.) Also known as Great Willow Herb. This is a plant of open, recently disturbed land, particularly of burned over areas- hence that name - FIREWEED. In established gardens it is usually at the edge of a planted area, such as next to a path. It grows only in sunny areas, reaching up to six feet in height with pink to purple flowers with four rounded petals. The unique identifying part of the plant is the leaf vein system where the lateral veins do not reach the edge of the leaf but instead join an outer margin loop vein. Once the flower fades a thin seed pod is formed that sticks straight out from the stem. You might then think this is a Mustard family plant, but no, it is in the Evening Primrose family. Its arrival in the Garden is worth exploring. Eloise Butler tried to grow it for years. She brought in plants from the East Coast in 1909 and 1912. In 1924 and '25 she got more from local sources. Martha Crone planted some in 1933 and Gertrude Cram sent Martha some seedlings from Isle Royal in August 1934 with the note "Miss Butler said nothing would ever induce it to grow for her but I thought you might like to make another attempt." It is an international plant with a number of folk and herbal uses. It was used as a tea substitute in England and Russia and said to make a quite tasty tea; the French Canadians liked the young flower stalks and leaves as salad ingredients; fireweed honey is said to be very prized by the honey people. Frances Densmore reports that the Minnesota Chippewa used it for bruises. P.S. It blooms every year in the Upland Garden. She cultivated it - planting it in the Garden in 1907, 08 and 09. Martha Crone planted it also. 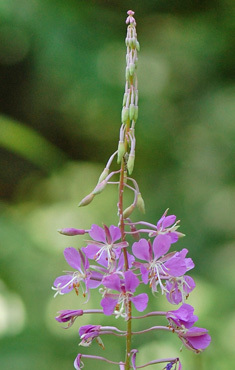 On each stem a group of buds develop near the top, but only one flower on that stem opens at a time. The plant puts up multiple stems so the show is quite good. This is a native St. Johnswort. 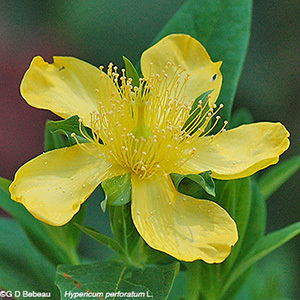 Hypericum is a large genus - many from Europe where certain species have become well used in the herbal supplement market. The genus name is most interesting; it is from the Greek hyperikon, meaning 'above picture' and refers to the old practice of placing parts of a Hypericum above images to ward off evil during the old midsummer festival of Walpurgisnacht, which later in Christian times became St. John's Day on June 24th - the day when the plant was usually blooming. The common name of 'St. Johnswort' is a European reference to that feast date.